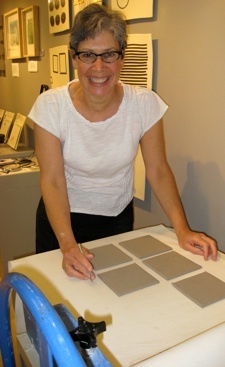 Lori Katz works as a ceramic artist in the Washington, DC area. Her work has been selected for juried and invitational exhibitions in the US, Europe and Asia, and is included in public and private collections throughout the world. Lori’s first experience with clay was on a table-top potter’s wheel that her parents bought for her when she was twelve. Lori's current focus is on work for the wall. Her pieces are stoneware with some mixed media. Additions to the raw surface can include contrasting clays, slips, underglaze and high-temperature wire. Post firing additions can include acrylic paint, oil paint, cold wax and metal leaf. "I am intrigued by contrast, the play of dark against light, the pull of empty space against the inclination to fill it up, the placement of line and shape, the use of subtle texture, balance. Several years ago, I began working almost exclusively in a palette of black and white in what was a conscious effort to simplify process and design. Lately, color is finding its way back in as my work continues to evolve. I have learned that in the end, process is never simple and good design is always balanced and strong."